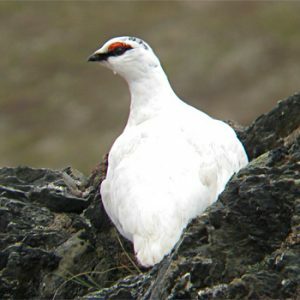 The Rock Ptarmigan is a chicken-shaped game bird of the Arctic. Belonging to the grouse family, this bird is known to be a ground dweller acquiring different plumages. It is bird suited for the cold regions such as Alaska and Greenland. Widely known as a circumpolar due to its habitat, these birds are considered to be the ideal inhabitants for tundra region. This particular member of the grouse family has certain distinguishing features that are worth mentioning. Color: These birds change their color between seasons and bear a camouflaged appearance according to their periphery. 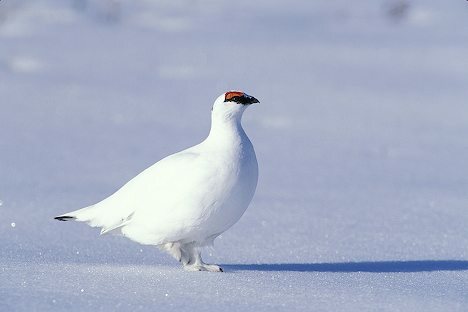 During the winter months, the color of this Ptarmigan transforms into white, except the black line near its eyes and angled tail. In summers, the color turns to blotchy dark. Males bear a grayish brown colored back along with a whitish belly and wings. The females encompass brown and gray feathers on their body. Length: These Ptarmigans are at least 34-36 centimeters long, added with a wing gap of 60centimeters. Tail: The tail of these birds are square in shape. Legs: The legs of these birds are completely feathered. The toes help them to keep their body warm and walk comfortably in the snow. These Ptarmigans are seeable in the entire Polar Regions and prefer to dwell near the Arctic Circle. In North America, their distribution range includes Canada and Alaska. 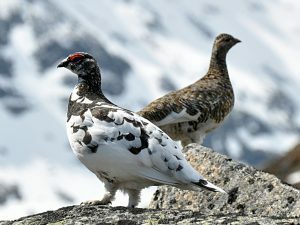 Scandinavian region, Finland, Greenland and Russia are some of the places where these Rock Ptarmigans can be found in large numbers. Considered as a sedentary species, these birds spawn across North America, arctic and tundra. These heavy bodied birds prefer to live in a cool remote area with abundant of brush, thickets and willows, such as the alpine, thus experiencing less threat from its predators like Golden Eagles. These monogamous birds have certain behavioral traits that distinguish them from the other members of the grouse family. These birds prefer to stay in the tundra region during the winter period. Travel short distances in search of food for their family. 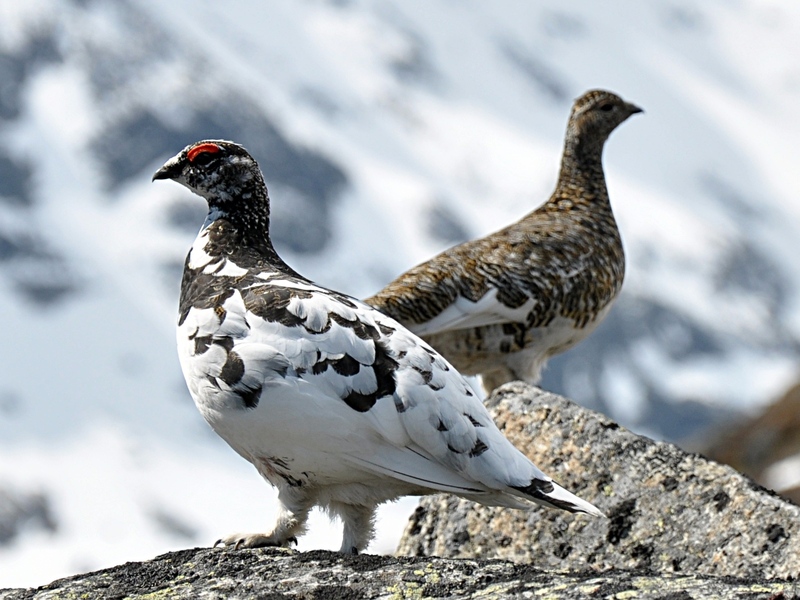 The male and female Ptarmigans live in different groups, during winter. These birds are aggressive in nature. The principal food for these omnivorous species includes birch, catkins and willow buds. Leaves, twigs, flowers, seeds and berries of various plant species are also consumed by these birds. The juvenile birds devour small insects and pests. The terrestrial birds experience life threat from a number of predators present in the tundra region. Their predators include glaucuos guls, arctic skuas, arctic foxes, golden eagles and ermine. 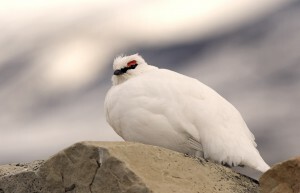 The special adaptive features of this Ptarmigans help them to exist in the natural habitat. These monogamous birds use their changing skin as a camouflage to adapt the shifting environment. These birds can commence a full upward flight from a seating position. The feathered legs provide enough warmness to these birds and help them to walk in the snow. The black stripe diagonally from the eyes, act as a goggle for these birds and prevent them from snow blindness, by minimizing the impacts of sun’s reflection on the snow. These birds can burrow themselves in the snow to avoid the cold winters and their predators. The male Rock Ptarmigan select the breeding territory and protect them from other males with chases, calls and aerial displays. After spawning, the females lay 6-10 eggs in a hollow place covered with grass, in the spring season. The males leave the females after incubation. These birds prefer to breed in the hilly areas of the tundra regions, to avail the high steep valley slopes comprising of thick shrubs, patchy herbs and grasses. The male birds sing in a loud hoarse voice to attract females, during breeding. The females can identify the respective males among hundred others by hearing its croaky call. In various festivals of Iceland, the Rock Ptarmigan meat is used an important meal. To prevent its extinction, hunting of Rock Ptarmigan was strictly banned. Selling of this species is also a criminal offense. This terrestrial bird is conserved as a “Least Concerned” species by the IUCN. However, rules have been implemented to stop the hunting of these birds, to prevent them from complete annihilation. These heavy bodied birds bear some interesting features that are worth highlighting. It is the official bird for the territory of Nunavut. It is the certified game bird for the province of Newfoundland and Labrador. It remains three year round in the Arctic region. Here are some spectacle Images of this birds.